It may seem strange to talk about beef in a blog posting that is all about a vegan recipe, however, last Sunday night, we had our first experience with grass-fed beef. Let me just say that if grass-fed were the last beef on earth, I would certainly become strict vegetarian or even vegan. Perhaps we just got a bad cut of skirt steak, but I’ve had conventional skirt steak and love it. We marinated it in a Korean-inspired marinade, grilled it to medium, then thinly sliced it against the grain. Could. Not. Chew. It. Grass-fed beef is all the rage, but I don’t think it’s for us. Instead, we filled up on the vegetable sides we prepared to go with the beef. No, I probably won’t give up beef forever, but after that grass-fed skirt steak, meatless is awfully appealing right now! 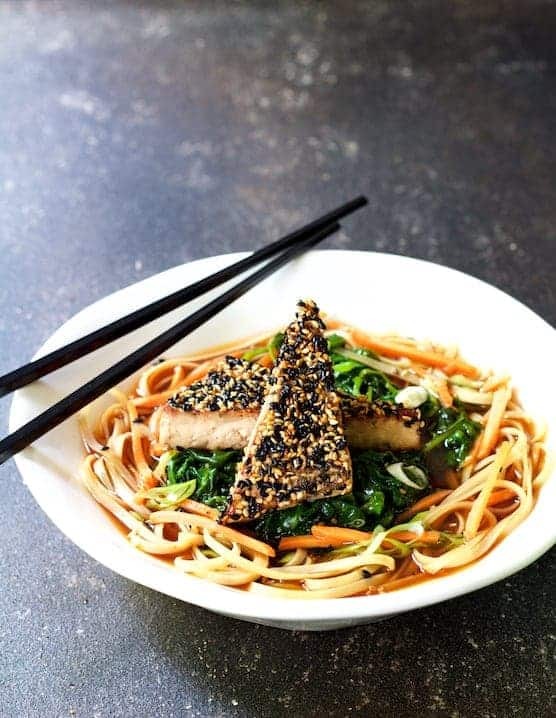 Sesame Tofu with Spinach and Rice Noodles in Ginger Broth is satisfying, healthful, light, vegan, easily made gluten-free and a textural and flavor explosion. If you’re a meat-eater, it will be hard to miss the meat. Tofu tends to suffer from an image problem because alone it is rather bland. However, that quality–much like a piece of plain unseasoned fish or chicken–makes it a culinary blank canvas. Tofu absorbs the flavor of anything it is cooked with. Tofu is packed in water, therefore, it’s necessary to gently press the water out of it. Cut it into pieces, then place on paper towels or a clean kitchen towel. Place another layer of towels over the tofu, then place a baking sheet on top. Weigh it down with heavy books or a cast iron skillet. Let sit for about 30 minutes. You’ll be amazed at how much water was in the tofu! Here’s more information on how to do it from About.com. 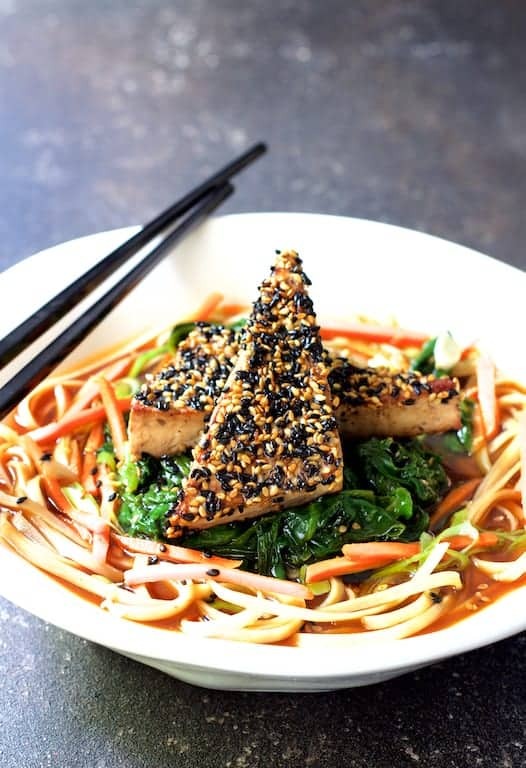 Marinate the tofu briefly in soy sauce and rice vinegar, then dredge in a combination of black sesame seeds, white sesame seeds and freshly cracked black pepper. Cook the spinach first, transfer to a plate and keep warm with aluminum foil. To cook the tofu, reduce the heat to medium and cook it one to two minutes per side. You want to be careful not to burn the seeds. The ginger-infused broth makes a delicious low-calorie alternative to a sauce. Any baby green such as kale, bok choy or mustard may be used. Serve atop brown rice noodles topped with shredded carrots and thinly sliced scallion. Delish! Who needs the beef? Cut the tofu into four even squares widthwise, then cut diagonally into eight triangles. Place on paper towels or a clean kitchen towel. Place another layer of towels over the tofu. Place a baking sheet over the tofu, then weight it down with books or a cast-iron skillet. Let sit for 30 minutes. Combine 1/4 cup soy sauce and 2 tablespoons rice vinegar in a shallow pan. Place the tofu triangles in the marinade for 20 minutes, turning once. Meanwhile, combine vegetable broth, remaining soy sauce, remaining rice vinegar, ginger, 4 cloves smashed garlic and chili garlic sauce in a saucepan. Bring to a boil, reduce heat to medium-low and simmer 20 minutes. Combine sesame seeds and black pepper on a plate. Drain tofu but do not pat dry (the marinade helps the sesame seeds stick). Dredge in seed mixture. Heat 1 tablespoon oil over medium-high heat in a large non-stick skillet. Add the baby spinach and minced garlic. Cook 1-2 minutes or until JUST wilted. Transfer to a plate and tent with aluminum foil to keep warm. Add remaining oil, reduce heat to medium and add tofu pieces. Cook 1-2 minutes per side, being careful not to burn the seeds. Divide cooked noodles equally among four bowls. Strain the broth into the four bowls over noodles. Divide spinach equally, top with two tofu pieces per bowl. Garnish with green onions and carrots. Serve immediately. Prep time includes draining tofu and then marinating it. TO MAKE GLUTEN-FREE: Use wheat-free tamari, gluten-free soy sauce or coconut aminos. Thanks! Do let me know how you like it! This is my kind of rice noodle bowl. I simply love Asian food. Thanks, Miryam! I do also and there’s just something about noodles, broth and veggies that sings to me especially Asian-inspired! Thanks, Meg! Let me know how you like it. I love everything about this dish! The flavors, the colors, the textures – it all looks absolutely divine! Pinning for sure! Gorgeous! I think I can even trick my husband into eating this one! Thanks, Krayl! Ha….If my hubby is hungry, he’ll eat!